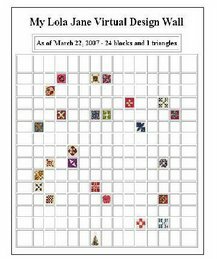 Lola Quilts: I have not fallen off the earth! Boy, I didn't realize that it had been so long since I last posted! I've made a change in my life - I am now a full time student (as of last Fall.) I have one more year to go until I get my Bachelors - the month I turn 50! That is if I can pass this statistics course I'm in right now. Numbers have never been a strength for me. I've wanted to get my degree for a long, long time but with moving so much it was pretty impossible. We are here in Iowa for a little while I think - so now is the perfect time. School has definitely cut into my quilting and beading time! But it feels good to use the other side of my brain. I am usually the oldest in my classes and it is hard to keep my mouth shut at times. I don't want to be the "old lady" in the class that always talks! It was especially hard last semester when I took a political science class! Wish me luck in statistics!!! That's awesome that you are going back to school. I wish you much success. Good for you for going back to school! I'm 47 and never finished the degree that I started working on when I was 18. I'd like to finish one day too! You'll get through Statistics! It's wonderful to continue your education! I was a political science major. Trust me everyone struggles with stats. Oddly enough its the one math you're least likely to encounter ever again. Pedal through as best you can and good luck. Congratulations again. I love your scrappy taste in quilts! You have done some wonderful projects. Good luck with your machine quilting. Good for you! Glad to see you posting again. See my kitties that adopted me on my blog! I really like the projects you have going that are shown on the side of your blog! Good luck, and hope to see you again here!